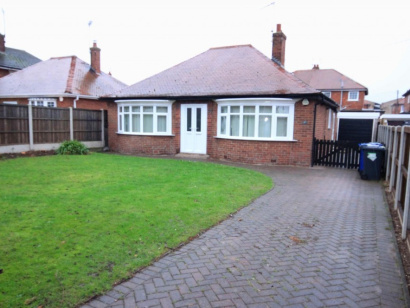 AVAILABLE - Set on this sought after section of road in this well regarded suburb of Doncaster, this recently refurbished detached traditional style bungalow offers good size accommodation. PVC double glazed doors give access to an entrance vestibule. Having a timber and glazed internal door which leads into an entrance hall. 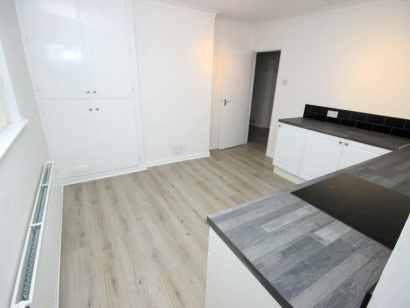 This has wood style laminated flooring, a central heating radiator, coving to the ceiling and doors leading off to the remaining accommodation. 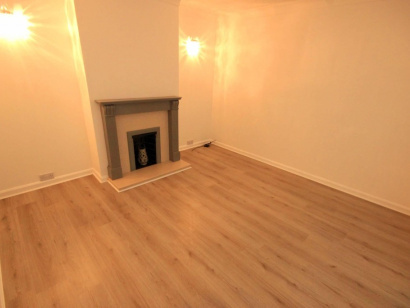 A nice sized square room which has a big PVC double glazed window to the front, a central heating radiator, coving to the ceiling and an attractive feature fire surround with marble inset and hearth plus decorative fire inset. Fitted with a range of shaker style base units with a contemporary style grey wood effect rolled edge work surface, incorporating a brushed stainless steel electric oven with an electric ceramic style hob with tiled splashbacks. There is wood style laminated flooring continued through from the entrance hall, a further built-in storage cupboard housing the gas combination boiler, a PVC double glazed window to the side and rear elevations, a double panelled radiator and a doorway leads into a utility room. Having a single bowl stainless steel sink with units and work surface matching those in the kitchen, with black ceramic tiled splashbacks, a PVC double glazed window to the rear, spotlights inset to the ceiling plus a useful built-in cupboard housing the utility meters. A PVC double glazed door leads to the side of the property and once again there is wood style laminated flooring continued through from the kitchen area. 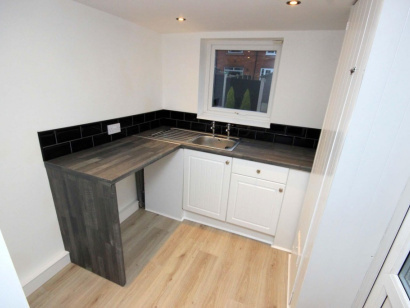 13'10" to bay x 11'11"
A lovely sized double bedroom which has a large PVC double glazed bay window to the front, a central heating radiator, coving to the ceiling and wood style laminated flooring. Another good sized double bedroom having a PVC double glazed window overlooking the rear garden, a double panelled radiator, coving to the ceiling and wood style laminated flooring. Fitted with an attractive three-piece white suite comprising of a low flush WC, a pedestal wash hand basin, a panelled bath with a Victorian style chrome mixer tap and shower head plus a folding brushed aluminium and glass shower screen. There is a built-in former airing cupboard with shelving for bathroom linen, a tiled effect vinyl floor covering with a PVC double glazed window to the rear, a single panelled central heating radiator and an extractor fan. To the front of the property, there is a good sized lawn garden which has a good degree of privacy with a high hedgerow to the front plus fencing to the left and right boundary. Cast iron gates open into a block paved driveway which provides ample off-road parking for several vehicles and gives access to the side of the property where there is a detached concrete sectional garage. This cannot be accessed via a vehicle due to concrete steps giving access into the main dwelling. However, it has a metal up and over door whilst also providing excellent storage space. To the rear, there is a good sized area of lawn with decorative borders stocked with some small trees, there is concrete post and timber fencing plus a further concrete area suitable for a patio in the summer months. It should be noted that the rear garden is fenced off from the driveway to provide that extra bit of security. AVAILABLE IMMEDIATELY, subject to satisfactory referencing. The landlord has requested: No DSS, No Pets and Non Smokers only. 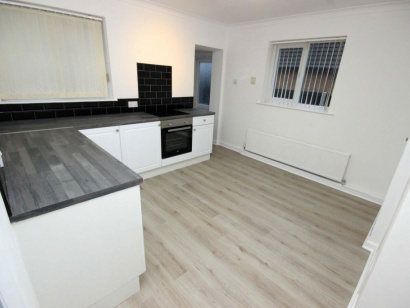 Central Heating - The property has a gas fired central heating system fitted. 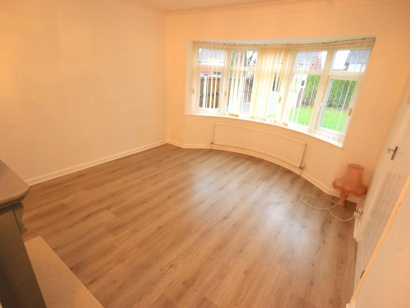 Double Glazing - The property has double glazing fitted. Viewing - By prior telephone appointment with horton knights estate agents on 01302 760322.